Decorations transform a boring kennel into a work of art. 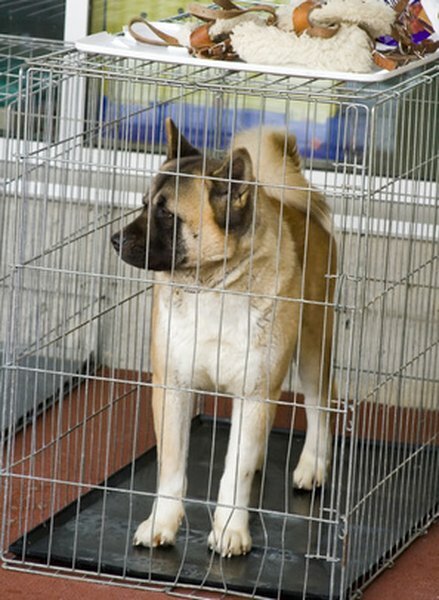 While kennels are a necessity for many pet owners, they certainly won’t win any beauty contests. If you’re tired of hiding your pet’s crate when company comes over, decorate it instead. A few simple changes will transform your kennel from drab eyesore to fabulous focal point. Paint an interesting design on a boring plastic crate. Pick a few bottles of non-toxic color and get your paint on. If you’re not particularly artistic, paint the entire kennel one color, and add your dog’s name in a complementary color. For a fun, personal touch, paint the bottom of your dog’s paw and press it onto the dry base coat. Wash the dog’s foot thoroughly to remove all traces of paint. Decorate your wire crate with ribbons. Cut a long length of ribbon and tie it to one corner of the kennel. Weave the ribbon in and out of the wire bars, and tie it off at the opposite corner. If you don’t like the look of woven ribbons, tie a few bows along the bars. Add a playful touch to your kennel with stickers. Stickers will cling firmly to plastic crates, and can be applied to any solid surface. Stickers come in countless shapes, sizes and types, so pick those that catch your attention. For a fun twist, pick up a pack of stickers that represent your dog’s breed. Slip a cover over the kennel to completely disguise it. Kennel covers come in a wide range of fabrics and textures and can be matched to your existing decor for a clean, seamless look. Slide the cover over the crate and adjust the straps until the cover fits tightly against the top and sides of the crate. Tie ribbons out of reach if your dog is a chewer. The soft texture of most fabrics is very enticing and will encourage your dog to eat away at your hard work. Crate covers are also beneficial for crate training. 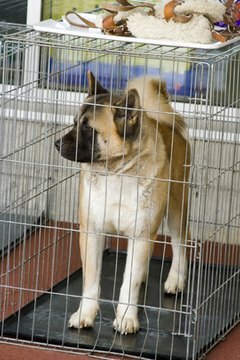 They close the dog off from distractions and give many dogs a feeling of comfort and security while crated.